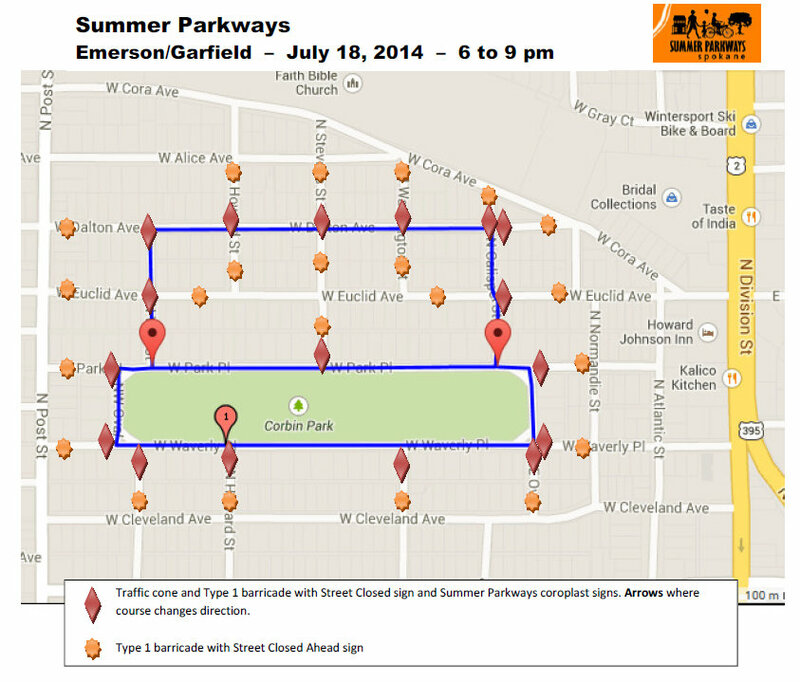 Summer Parkways is returning to our neighborhood for the first time in several years, so the Emerson-Garfield Neighborhood Council has teamed up with them to create an all-out block party on Friday, July 18. It will run from 6-9pm in Corbin Park and some of the surrounding streets (click here to view the traffic plan). As part of the festivities, our annual Concert in the Park will be held in the heart of Corbin Park from 6-8pm. This year’s featured musician is a duet version of the award-winning Sara Brown Band. Popular prepared food vendors like The Scoop and Pizza Rita will be there too. The Emerson-Garfield Farmers’ Market, which runs from 3-7pm (as usual) just a few blocks away, is part of the event’s unofficial bike/walk itinerary. Stop by first to get some freshly picked, locally grown fruit and vegetables, drop them off at home, then head over to the start of the fun in Corbin Park. And remember: This event is what you make it! Arrange a slalom for skateboarders in the street in front of your house. Help your kids set up a popsicle or lemonade stand. Hold a sidewalk chalk art contest. Invite a garage band to play an acoustic set. Or just have a BBQ for friends and family on your front lawn. If you’re on Facebook, join the event here.